The Bora the biggest push magnet designed for flat surfaces! Quick and Easy Clean Off without Lifting or Bending Over! 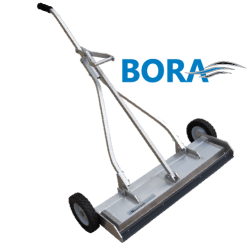 The Bora is the biggest magnet Bluestreak makes for a push type sweeper for flat surfaces with two layers of C8 ceramic magnets packed end to end and loads of features. Specifically designed for heavy use by professionals who need all the features of quick clean off, height adjustability, lifting power and durability. 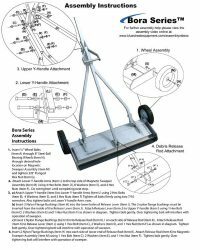 The quick and easy clean off system makes removing the debris off the sweeper quick and easy. Drop debris with a quick and easy pull of the convenient debris release handle, no lifting or bending over. 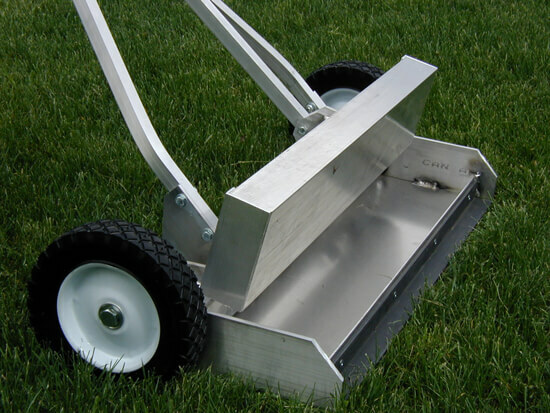 The Bora is designed for use on flat surfaces such as concrete and asphalt and not recommended for use on grass. For flat surface applications the Bora has it all! Magnet housing is lifted from debris with a quick release handle. "Took me about 20 minutes to remove it from the great packaging and put it together. I put it to use. Just as advertised. I commend you. I was a contractor for many years and this sure beats the old magnet sweeps we used. The release feature and intelligent design of all fittings are great. Preventing one untimely flat off sets the full value of this tool to me… I really dislike untimely flats. Or even a bit of wire or metal ingestion to a goat or calf, all the while trying to figure out what they ended up dying from." 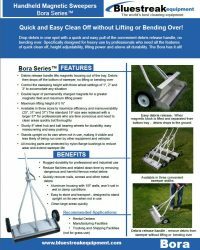 The Bora was originally designed for commercial type flat surfaces where no grass or dirt or uneven surfaces would be encountered and therefore does not have the “wrap around” feature, but by not having the wrap around feature it allowed the Bora to be designed with a super strong supporting back frame in the form of a 2” by 2” tube welded to both sides to increase the Bora’s durability. 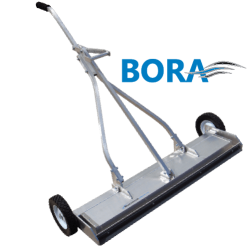 Because the Bora was designed for commercial applications it has the biggest magnet we make in a push type sweeper, with two layers of C8 ceramic magnets packed end to end, unspaced, with a steel backing plate to make the magnetic field larger and extend it downward. We don’t space our magnets out in the housing like most competitors do. This not only means there is more magnet in our housings, but it makes the magnetic field larger. 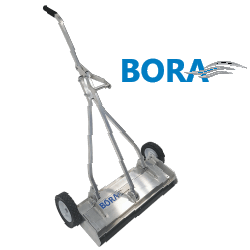 The Bora is ideally suited to manufacturing facilities, trucking yards, around landfill scales, picking up steel shot from shot blasting operations, and many other commercial or industrial applications. Debris release handle lifts the magnetic housing out of the tray. Debris then drops off the bottom of sweeper, no lifting or bending over. Two layers of C8 ceramic magnets packed end to end, unspaced, with steel backing plate to make the magnetic field larger and extend it downward. 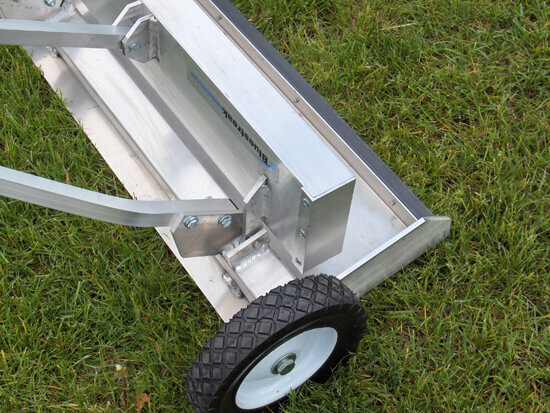 Control the sweeping height with three wheel height settings of 1″, 2″ and 3″ to accommodate any situation. Designed with a super strong supporting back frame in the form of a 2” by 2” tube welded to both sides to increase the Bora’s durability. Double layer of permanently charged magnets for a greater magnetic field and maximum lifting power. Available in three sweeping width sizes to maximize efficiency and manoeuverability (25″, 31″ and 37″). Stands up on its own when not in use. Maximum lifting height – 5 ¾” (using a two and a half inch nail). My new Bora arrived by UPS today. Took me about 20 minutes to remove it from the great packaging and put it together. I put it to use. Just as advertised. I commend you. I was a contractor for many years and this sure beats the old magnet sweeps we used. The release feature and intelligent design of all fittings are great. No longer am I a contractor or writer of contracting and building issues, I will be using this tool on my own farm. Recently I have put up k’s of feet of new fencing, built new barns and corral, plus small animal cages. Despite best efforts wire pieces, screws and nails fall and do not voluntarily show themselves. Which brought me to wanting this better tool. Preventing one untimely flat off sets the full value of this tool to me… I really dislike untimely flats. Or even a bit of wire or metal ingestion to a goat or calf, all the while trying to figure out what they ended up dying from. If I had one suggestion, being I will use mine only on dirt and semi rough surfaces (occassionally in the shop), perhaps neoprene 3 inch wide or so wheels would push better for me. Hard wide wheels such as kids tricycles and heavy duty type toys used to have. Not sure what they have now, my kids have been grown a while. I am impressed you are asking as to satisfaction and tips or opinions. I hope you go on with much success. In Texas we love Canada, Cheers. The Bora31 arrived the afternoon of the 26th. The unit arrived via UPS and was well packaged in a wooden crate which had stiffeners and foam material to prevent shifting in transit. We put the unit in use around our inbound and outbound scales and it performed extremely well. The scale house staff can now sweep the scales on a daily basis. Equipment worked out great. Congratulations on a terrific product. I will recommend it to all my contractor friends. The Plant Manager unpackaged the sweeper this morning and is extremely happy with the product. I watched how it works and I was impressed – very strong magnet. We have had other sweepers in the past, but not like this one. My package (Bora25) arrived and I look forward to using it. I am impressed with your quick response and delivery. I will keep you informed.